when i first started blogging, one of the first blogs i followed (+ one of the first bloggers who was a regular reader of mine) was the wonderful caroline of chocolate + carrots. caroline is fellow southerner, + excitingly, a soon-to-be mama, with her first baby due in a few weeks! when erin at texanerin baking asked me if i’d participate in a surprise virtual baby shower for caroline, i couldn’t say yes fast enough! 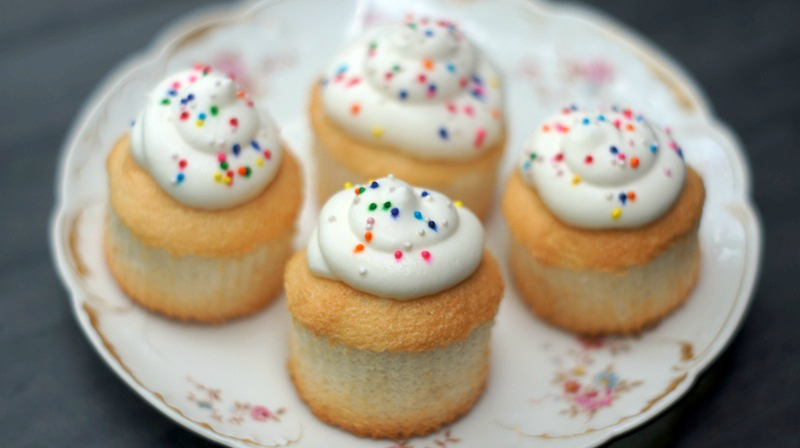 i knew immediately what i’d make – angel food cupcakes. i’ve had these cupcakes bookmarked for months, but hadn’t yet found the right occasion to make them. i knew that their light texture + pretty appearance would be perfect for any baby shower, virtual or otherwise. this was my first time making angel food cake, so i was a bit worried whether i’d be able to achieve the delicate texture + light, sweet flavor that i love so much. luckily, my fears were for naught – who knew that angel food cake was so easy to make? by following the easy step-by-step instructions, i wound up with a wonderful result – the cupcakes were light, airy, delicate, + just sweet enough. because angel food cake is so light, i didn’t want to overpower it with too heavy or bold of a frosting, so i opted for a simple vanilla whipped cream, which paired perfectly with the cupcakes. i highly recommend that you check out all the other fantastic things that people made for caroline’s virtual shower. these are some amazing bloggers with some seriously awesome recipes! let egg whites sit at room temperature for about one hour before beginning. while eggs are resting, measure out powdered sugar + flour, then sift powdered sugar, flour + salt together. set aside. line a cupcake tin (or two) with cupcake liners. preheat oven to 350 degrees F + place rack in the bottom third of oven. using an electric mixer, beat egg whites until frothy. once frothy, add in cream of tarter, then beat at medium speed until soft peaks form. this took me about 5 minutes. gradually add granulated sugar with the mixer still on medium speed, continuing to beat until egg whites thicken a bit more with opaque, soft, droopy peaks. once there, beat in vanilla extract. remove the bowl from the mixer + sprinkle 1/4 of the dry ingredients over the egg whites. fold gently with a spatula until combined completely. continue with the rest of the dry ingredients – I did this in three increments. once batter is smooth, use a 1/4 cup measure to pour heaping scoops of batter into each liner. bake for 18-19 minutes, or until tops are golden brown. let cool completely, then frost as desired. i frosted mine with a simple fresh vanilla whipped cream, using 1 pint of whipping cream, 2 tablespoons of sugar, 1 teaspoon of vanilla extract, + beating until thickened. What great cupcakes. So cute, and great for a baby shower! Yum! These sound so good! I am pinning these now! Amy, I have never seen angel food cupcakes, but what a great idea for a baby shower, if even virtual. I’ve started checking out some of the other dishes. I have my eye on that quiche.